In advance of our annual summer trip to the South of France, I’ll share with an article I was asked to write for a media outlet in Europe. For the past twenty years my wife and I have spent the better parts of August and September in the South of France. Five years ago, while lounging around the pool at the Chateau de la Messardiere in Saint-Tropez, the bartender came to my chair and, whispering discretely, let me know that my wife, Andrea, was locked inside the ladies room. This was when I decided to utilize the South of France as a location in my novels. 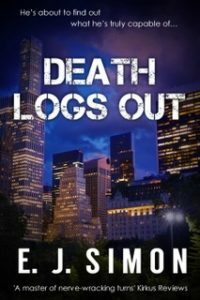 In both Death Never Sleeps and Death Logs In, my stories move from New York City to Paris, Rome and Florence but always wind up throughout the beautiful towns of southern France – mainly Saint Paul de Vence and Saint-Tropez. My upcoming third novel, Death Logs Out, will do the same. Now every trip to this enchanting region gives me the opportunity to live each moment – not only in the moment – but in the past and long after, through my writing. Even the tedious editing process is filled with joyous recollections of the great days and nights, and the incredible dinners I’ve experienced. Each restaurant and plate of Durade is the source of not only culinary pleasure but fuel for the imagination. After all, history is often made over dinner. Especially at restaurants like La Columbe d’Or in Saint Paul de Vence. It’s also about shadows – and ghosts. The ones who’ve been there before me, often long before, the important and the simply celebrated: Picasso, Matisse, Chagall, Simone Signoret, Bardot, Loren, Jagger, Cary Grant, Deneuve, F. Scott Fitzgerald, Colette . . . Dining at their tables, sleeping in their rooms, walking in their paths, trying to think what they thought, seeking inspiration where they once found it. In the case of my wife trapped in the Messardiere’s ladies room, I quickly went to the poolside building and watched while the hotel’s security staff worked to unlock the jammed door, all the while assuring her that she would soon be free. Ten minutes later, she was – and during that time I imagined a poolside murder scene at the Messardiere which I later wrote for Death Never Sleeps. Each time I returned to the Chateau and revisited the fabulous pool and watched the beautiful people all around it, I would also gaze back at the ladies bathroom, remembering the time my wife was trapped. Most likely I’d be taking in the sun, enjoying a light lunch and a few glasses of rose’. Before long, my mind would return to the murder. I’d look over at the lounge chair next to me, look at the pretty woman in the Jackie O sunglasses and feel relieved and secure in the knowledge that Andrea was right there, safe and sound. Sign up for the latest news, events, and book release information from E.J. Simon. Enter your name and e-mail address below.